I am having a hard time finding my family farm, based on the link below, on Norgeskart. Can anyone help? Ådal is an area in Ringerike kommune. This is not really a farm, but a cottage - and with a name like "Skogheim" (literally "forest home") difficult to locate. As Ann-Mary pointed out in her last entry, the farm where this cottage was located is now farm #305 in Ringerike (which is not where Trude located it - that Skogheim is a different one, not your family's). There is today no cottage by the name "Skogheim" on farm #305. However, the approximate location can be seen by tracing its neighbors on the 1900 census. If you go to the overview page for the census district at https://www.digitalarkivet.no/en/census/district/tf01037111000011 and go from entry 0035 to entry 0040, you will see that the census taker went, in order, from Briskodden to Stenbækken to Sætra to Skogheim to Løken to Velta. 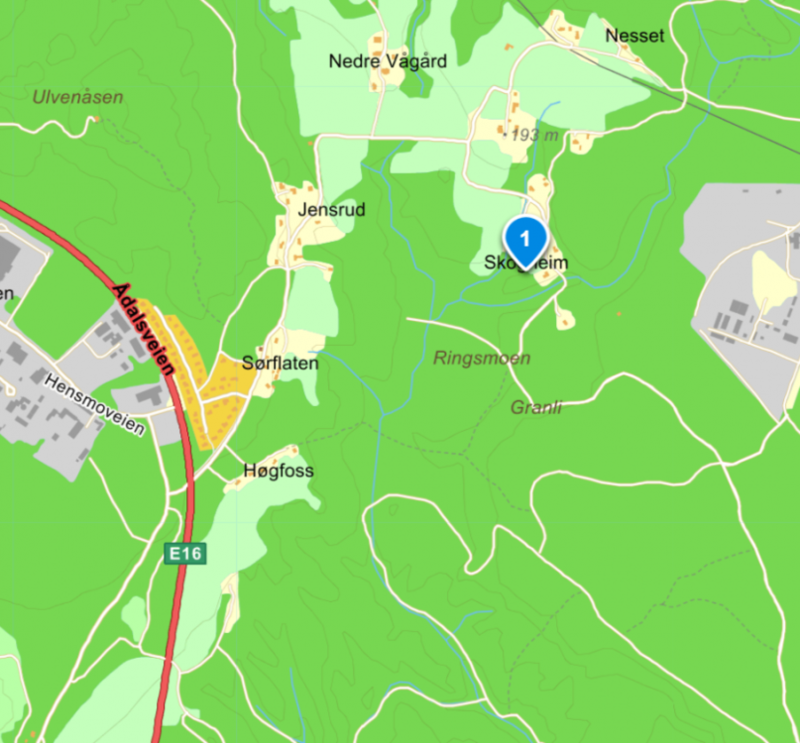 At norgeskart.no, you can find Briskodden as 0605-305/95 (type this number into the search box in the upper left corner), Stenbækken (now Steinbekken) as 0605-305/92, Løken as 0605-305/51 and 0605-305/47, and Velta as 0605-305/345. These all form a line, and so this suggests that Skogheim would have been somewhere between 0605-305/92 and 0605-305/51 - perhaps where 0605-305/91 (Nyheim) is now (see https://norgeskart.no/#!?project=seeiendom&layers=1002,1015&zoom=11&lat=6722863.27&lon=223839.54&panel=searchOptionsPanel&markerLat=6722863.266139134&markerLon=223839.5438636372&showSelection=false&sok=0605-305%2F91). However, notice that Erik Knudsen Skogheim just lived on a smallholding named Skogheim that belonged to farm nr. 5 (Holte). He did not own the farm. Thank you everyone!! Your information is so appreciated. Thank you so much, very helpful. This one was a tough one for me.